Abigail Fisher (1711-1785) is #277 on my Ahnentafel List, my 6th great-grandmother, who married #276 John Plimpton (1708-1756) in 1731 in Medfield, Massachusetts. * their son, #138 Amos Plimpton (1735-1808), who married #139 Mary Guild (1735-1800) in 1756. Abigail Fisher was born on 10 September 1711 in Medfield, Massachusetts, the fourth child (of seven) of John and Abigail (Smith) Fisher. She married John Plimpton on 3 May 1731 in Medfield, and bore him five children between 1732 and 1746. 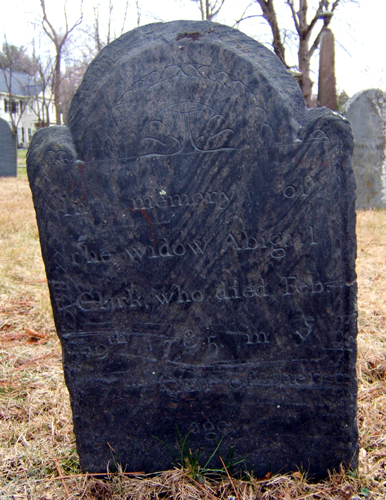 Abigail's father, John Fisher (1677-1727) died in 1727 in Medfield, and her mother, Abigail (Smith) Fisher, died in 1726 in Medfield. Her father's estate was probated, but had to wait until the estate of John Fisher Sr. (1652-1727), the father of John Fisher Jr. (1677-1727) was settled. Because the real property of her father, John Fisher Jr. (1677-1727), could not be divided without prejudice, Abigail (Fisher) Plimpton's brother was awarded the real estate and ordered to pay to Abigail and her siblings 6 pounds, 16 shillings from their father's estate on 16 September 1735. After John Plimpton died in 1756, Abigail Plimpton and their son Amos Plimpton were named adminsitrators of his estate. The inventory was £375, which included over £305 in real estate. Abigail's thirds were set off in 1759. Abigail Plimpton married, secondly, to David Clark on 6 May 1771 in Medfield, and they had no children. David died soon after the marriage, on 22 June 1771. After Abigail (Fisher) (Plimpton) Clark died in 1785 in Medfield, the Court ordered Daniel Perry, Asa Hammant and John Baxter to divide the property that had been set off to Abigail, widow of John Plimpton. The eldest son, Amos Plimpton received the personal and real property of his mother, and was ordered to pay his three siblings about 20 pounds each. 1. Vital Records of Medfield, Massachusetts to the Year 1850 (Boston, Mass. : New England Historic Genealogical Society, 1903), Births, page 50, Abigail Fisher entry. 2. Vital Records of Medfield, Massachusetts to the Year 1850, Marriages, page 139, Abigail Fisher and John Plimpton entry. 3. Suffolk County (Massachusetts) Probate Records, 1636-1899, Family History Library, Salt Lake City, Utah; on 435 FHL Microfilm Reels., Probate Packet 5,512, John Fisher Jr. of Medfield, on FHL US/CAN microfilms 584,132 (Vol. 15), 584,137 (Vol. 25-26), and 493,466 (Vol. 32). 4. Suffolk County (Massachusetts), Probate Records, 1636-1899, Probate Packet 11,295, John Plimpton of Medfield, on FHL US/CAN microfilms 493874, 493875, 49,876, and 492890. 5. Vital Records of Medfield, Massachusetts to the Year 1850, Deaths, page, 200, Abigail Clark entry. 6. Jim Tipton, indexed database, Find A Grave (http://www.findagrave.com), Vine Lake Cemetery, Medfield, Mass., Abigail Fisher Clark memorial # 17200320. 7. Vital Records of Medfield, Massachusetts to the Year 1850, Marriages, page 201, David Clark and Abigail Plimpton entry.